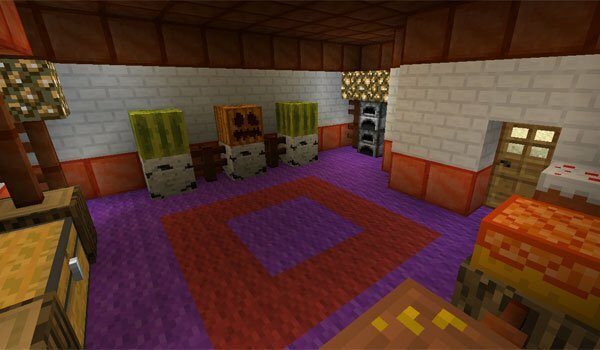 Today we bring you a mod that gives greater versatility of food in Minecraft. Lots of Food 1.10.2 adds new crops such as peppers and vineyards, plus fishes to fish, crystal glass and coconut. Cakes: Carrot, cheese and chocolate. Chocolate: milk chocolate, hot chocolate, only chocolate, chocolate bread. Soups: pumpkin, cactus, fish and vegetable. Pasta dishes: plain pasta, pasta with chicken and pasta with pepper. Juices: Carrot juice, cactus, coconut, apple, grape and watermelon. But the thing don’t stop here, continue on: cheese, pizza, slices of bread, sandwiches, tea, mashed potatoes, sushi, seaweed stew, chorizo, chili con carne, candy, egg. Addition of new blocks of chocolate, caramel, sugar and chocolate fences. If you explore a little world we can find “sweet homes”, miss candy, sugar and chocolate, where you can find plenty of food in their chests, but have a fairly low rate of occurrence. How to install Lots of Food Mod for Minecraft 1.10.2? Increase the amount of food in Minecraft!